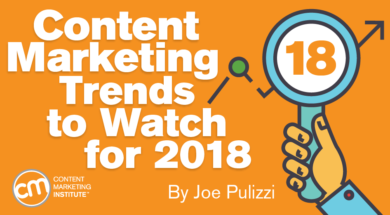 About 12 months ago, I covered some content marketing trends to watch for 2017. I recently reread that post and most of the trends are very much in play for 2018 and beyond. Most enterprises are still working through creation of a true, living content marketing strategy for their organizations. Native advertising is still the gateway drug for many content marketing programs, and mobile is, well, it continues to be the flavor of every month as consumer use grows. But some truly interesting events have occurred over the past few months that, I believe, begin to speak to the evolution of the content marketing practice itself. Reports surfaced recently that Apple, the most valuable company in the world based on stock market capitalization, is planning to invest over $1 billion on original content. (Robert and I discussed this at length in the This Old Marketing podcast Episode 197.) Although there is talk about this move positioning Apple to take on Netflix, we believe this move is more significant than Apple just getting into the television show or streaming video business. Apple needs to stay relevant and consistent; valuable programming can grow its audiences and keep their attention (just like for any other company). We also know that Google is purchasing original content from both brands and media companies (we’ve learned this firsthand), specifically to fill content gaps found through their search algorithms. And, not to be outdone, Facebook is spending significant dollars on original video directly out of the marketing budget. And don’t leave out perhaps the biggest buyer of original content, Amazon. What all this means we don’t know yet, but one thing is sure: Consistent, original, and addictive content is all the rage. In some ways, we are seeing the golden age of a new television … it just happens on any and every device imaginable. How does this affect you? First, if your main competitor isn’t betting big on original content, it will be soon. The window for building a trusted and loyal audience is happening right now. Second, those who build new and trusted content brands will have multiple options to monetize that content, either directly from customers or prospects or secondarily from syndication through the Apples and Googles of the world. Some will create, while others will buy. After we have brought this to your attention for years, the acquisition of content brands is now a major trend. Arrow Electronics, the Amazon of electronics components, purchased 51 (yes, that’s right) media properties from UBM and Hearst, and has created the largest media company in the B2B electronics industry. It now reaches 76% of electronic engineers and has a separate division running the for-profit unit. In early August, Netflix made its first major media acquisition, buying comic book publisher Millarworld. This is yet another signal that Netflix is moving away from licensing other people’s content to create its own intellectual property. The build-it or buy-it question is still in play, and from the current flow of money, it looks like both avenues are strong and growing in the content creation and distribution space. Late last year, both Mondelez and Pepsi announced significant investments in the launch of internal content studios. Judging from the comments from the marketing leadership at both companies, a portion of these marketing arms will generate revenue and includes the possibility of for-profit ventures. CMI believes that is the next iteration of content marketing – building multiple audience groups within the enterprise and monetizing those groups in dozens of ways. Eventually, some innovative companies, like Arrow and Johnson & Johnson (with its babycenter.com), will generate enough revenue to outpace expenses. The marketing department will become a self-sustaining entity. As Robert Rose and I discuss in our new book, Killing Marketing, even if the marketing profit center isn’t possible in your organization, the process of wrapping your arms around the costs and benefits of content creation is critical. All senior marketing executives are curious about the creation and flow of content, especially since nearly every company is creating more content this year than last. This is both good and bad. I’ve been in this industry for almost 20 years, and it’s amazing to see marketing departments committed to the practice of content marketing with real marketing dollars. That said, I’m also concerned by the campaign nature of these budgets. Recently, I met with a group of senior marketers at a large consumer-technology company. They doubled their content creation and promotion budget from 2015 to 2017 (which is great), but most of the investment was in projects (which is not great). These projects were three- to six-month video series or time-based native advertising programs. Sound familiar? It should. Most brands still treat their content marketing like advertising. For content marketing to truly work, it must be differentiated and consistently produced over a long time (like media companies do). I’m afraid that most of these content marketing investments will go without bearing any fruit … and that’s why we still have a long way to go in our content marketing journey. Over the summer, we began working with a large health-care company. Its content marketing results have been outstanding as it’s grown a number of content brands and audiences while slowly pulling away from traditional advertising. It’s been so successful that it caught the attention of the CMO and the entire marketing organization has content fever. The unexpected consequence is a turf war and a disjointed strategy. PR and communications have hired their own content team members separate from the company’s official content studio. Social media roles overlap, and everyone and no one is in charge of the content marketing strategy. We’ve seen this happen (it’s one of the reasons why we wrote Killing Marketing). Marketing leaders need to step up and give ownership to someone to lead the content strategy, which ultimately must be a mandate coming from the chief marketing officer (or higher). Practitioners, in turn, need to get together with other department leaders as quickly as possible and make sure everyone is on the same page. This is a difficult challenge, as some marketing leaders may think a content land grab is necessary (so they can save their jobs). Overall, I see this as the most exciting time in marketing, where we can build audiences directly and make a major impact in the overall business model for the organization. That said, this move will come with pain points and challenges as we see the deconstruction and rebuild of the marketing department as we know it.